Saving for a rainy day is cliché but an important one. Without an adequate amount of liquid savings, one accident or unfortunate event can place someone in dire financial straits quickly. As part of the POPSUGAR Insights 2017 Personal Finance Report, we surveyed nearly 2,000 women between the ages of 18 and 44 to ask them how they manage their finances and think about their financial future. Overall, nearly half of women do not have a proper emergency fund available to them. 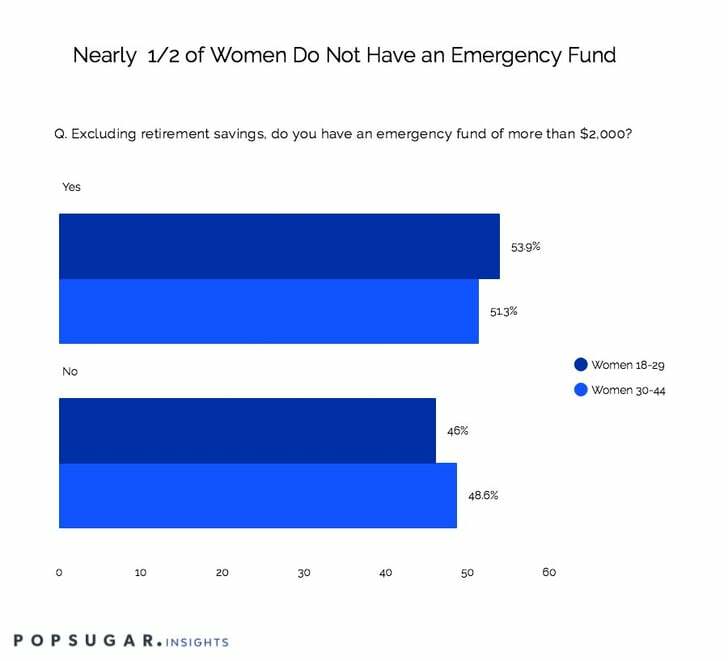 Women under the age of 30 are 5% more likely to have an emergency fund of that size and women between the ages of 30 and 44 are 6% more likely to lack an emergency fund of over $2,000. By not keeping a budget, not saving for retirement, and not having an emergency fund established, many women are facing a serious personal financial crisis. Brands have a unique opportunity here to educate women who are unhappy with their current financial situation and offer them valuable advice, and if applicable, the tools necessary to help establish a strong financial foundation. While endemic content about the importance of saving is valuable, other brands can seize the opportunity to highlight ways to "find savings" in other areas of a woman's daily life, from retail or grocery shopping, to saving money on a new vehicle, or ways to stay healthy.